Why did I not qualify? I just finished the group stages in the champions league joint on 12 points with 3 teams. FC Twente, Barcelona and me Shaktar. I beat FC Twente 3-1 and lost to them 3-1, and I had +5 goal difference and they had -1. And I scored more goals so why the **** did I not qualify? And what about against Barcelona, for you and Twente? It goes on head to head results I think so I'd assume it would how you both did against Barca. When three teams finish on the same points a mini league is created between those teams. The league is then sorted by the usual rules which in this case seemingly leaves your team third. If you provide the results of the above matches someone will do a table for you. Ok FC Twente beat Barcelona 2-1 at home and lost 3-0 away, I beat FC Twente at home 3-1 and lost 3-1 away, I beat barcelona 1-0 at home and lost 3-0 away. LOL WTF. 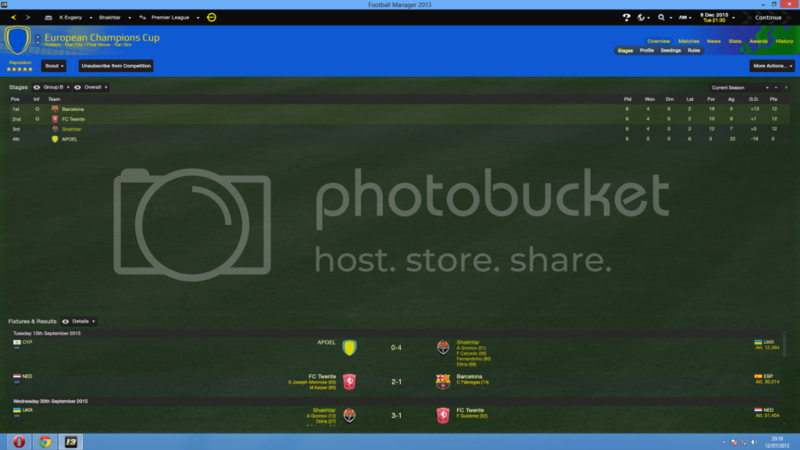 So I lose because Twente scored one more goal than me? They go through then with a better head to head against them I believe. Lol only football manager could make this **** happen. Well no, because it's real life. That 1-0 vs Twente's 2-1 against Barcelona lost it for you. Even when he's 137 years old he will score every single penalty he takes. Bit harsh, but them's the rules.